It's that time of year again. E3 is about to start and Shadow of the Tomb Raider is finally visible on the horizon! If you've been watching the official Tomb Raider social media accounts, you've probably seen these 30-second teaser spots featuring some of the game's developers offering glimpses of the story, mocap, level and puzzle design, lighting, sound, user interface, and more. Each video ends with a promise that more will be revealed at E3. The expo officially begins Tuesday, June 12, but there are several Tomb Raider presentations planned before that. The dates and times listed below are for Los Angeles (Pacific Daylight Time). Click the time links to convert to your local date and time. 1 PM PDT – Xbox E3 Briefing. This will include the first public look at Shadow of the Tomb Raider gameplay, streamed live on Facebook, Mixer, Twitch, Twitter, and YouTube, as well as on Xbox One. 10 AM PDT – Square Enix Showcase. This presentation will be streamed live on Square Enix's Facebook, Mixer, Twitch, Twitter, and YouTube. The official TR social media have not included it in their lineup, so it's not clear how much Tomb Raider coverage will be shown. 1 PM PDT – Square Enix Presents: Shadow of the Tomb Raider Developer Q&A. This interview with Crystal Dynamics' Rich Briggs and Eidos Montreal's Daniel Chayer-Bisson will be broadcast live on Square Enix's Facebook, Mixer, Twitch, Twitter, and YouTube. 11 AM PDT – Camilla Luddington Appearance, Lara's voice and performance artist, will be at the Tomb Raider booth. As far as I know, there are no plans to livestream this appearance, but check the official social media for details. 1:30 PM PDT – Square Enix Presents: Shadow of the Tomb Raider Q&A with Camilla Luddington and Earl Baylon. Camilla joins Earl Baylon, voice and performance artist for Jonah Maiava, to answer fans' questions and play a round of survival "Would you Rather?" Tune in via Square Enix's Facebook, Mixer, Twitch, Twitter, and YouTube. 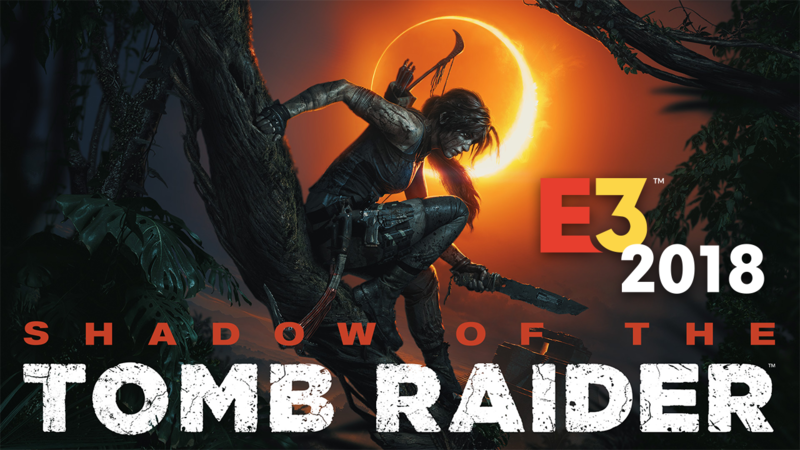 3:30 PM PDT – E3 Coliseum Panel: Camilla Luddington and the Shadow of the Tomb Raider Creative Team. Join the creative team and cast as they share new details about the game. Lead Writer Jill Murray and Performance Director Darryl Purdy join Camilla Luddington and Earl Baylon in a panel discussion moderated by Senior Community Manager Meagan Marie. Tune in via E3 Live. Also be sure to follow the official Tomb Raider and Eidos-Montréal social accounts for E3 coverage and updates. Shadow of the Tomb Raider will be released September 14, 2018, with 48-hour early access available with select pre-orders.